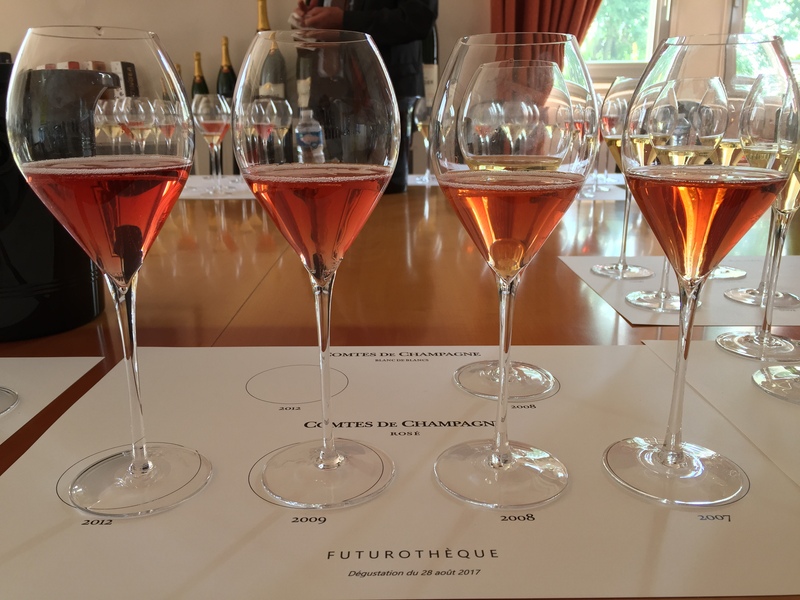 Our trip to Champagne in August wouldn’t have been complete without a visit to one of the region’s oldest producers: Champagne Taittinger. We were greeted by an elite team that included head honcho Pierre-Emmanuel Taittinger, daughter and Marketing Director Vitalie, General Director Damien Le Sueur and long-time Chef de Cave Loïc Dupont. Perhaps the busiest man in Champagne, Pierre-Emmanuel couldn’t stay long due to a television commitment in Paris that evening, but did share with us some of his more exciting plans over a short working lunch. He was particularly keen to discuss Taittinger’s recent investment in English Sparkling Wine – a bold move that surprised many in the industry when announced in May. Pierre-Emmanuel has no doubts about the potential quality of the Kent region and seemed specifically pleased with the efficiency of the English planning process compared to that of France. “I don’t like nationalism. I prefer brands. Look at our Domaine Carneros in Napa Valley,” he added. Pushed for time and with an immense tasting schedule ahead, we unfortunately didn’t have long to chat. 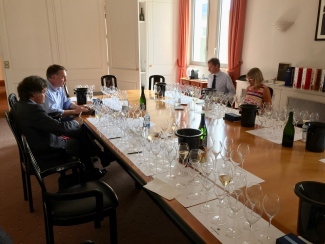 Head winemaker Dupont thus promptly introduced his plan for the afternoon: a comparison of six vintages of Brut Vintage from magnum and Comtes de Champagne from bottle, with the odd Comtes magnum thrown in for fun! 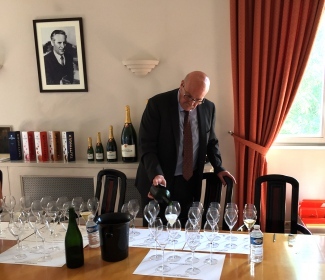 Briefly commenting on the best vintages of his tenure, Dupont expressed supreme confidence in both 2008 and 2012 and added that, whilst its too early to be certain, 2015 might be the next best year. 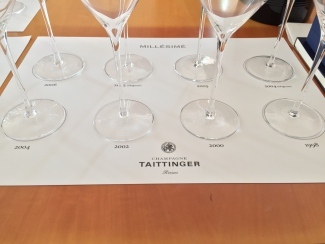 The impressive (and extensive) Taittinger line-up…. Bright and full of fizz. Just a hint of toasty character and some creaminess coming through. Lovely bubbles on palate and then loads of creaminess and toastiness. Lot of lemon and lime richness. Good balance of acidity and noticeable length. Very gentle, almost lazy bubbles – though maybe just an illusion. Initial lees nose with lemon and lime, seems perfectly dry on the palate, with all that lees spiciness that packs and adds to the fruit richness. Acidity seems lovely and forward and ripeness seems all there with some tropical hints coming in like pineapple and apricots. Ends fresh and zesty with great length. Has more lime and pineapple character and seems quite tight. On the palate it is very expressive with power of fruit and less; more smokiness and spiciness than the bottle. Very rich and acidity seems beautiful and full on. And the length goes on and on and has a density in the mid-palate that makes it seem fuller on the palate than bottle!? Comes straight in with richness on the nose of creamy caramel. Wow, on the palate the creaminess comes through with vibrant acidity and loads of personality. This has lots of fruit ripeness: apple and lemon abundant. Seems to finish quite dry with a hint of spice. Honey, apples and lemon on the nose. On first taste, this has the impression of being quite heavy; then you get some of those smoky and creamy characters all supported by fresh acidity and loads of fruit. Honey, lemon and creaminess goes on and on, medium length. Lots of upfront fruit creaminess/ripeness to the apple flavour. Has that appealing seductive nose and plenty of red fruit, with a hint raspberry character. The mouth-feel is showing really rich and full mid-weight. Smokey character on the palate, quite full weight and a mix of apple and apricot richness. Great length. Quite tight on the nose to start. Has great spicy character supporting bundles of fruit and fantastic length. Lovely elegant pastry creamy ending. Opens up on nose going back a few minutes later. 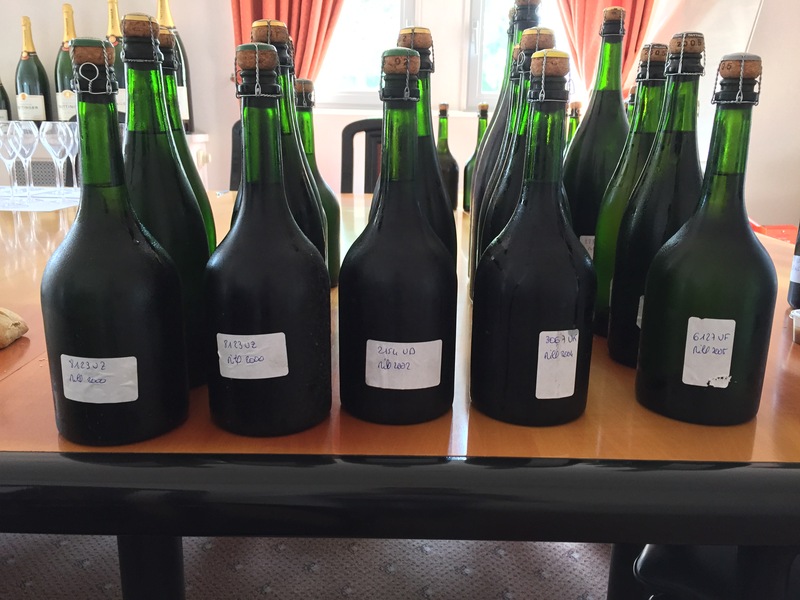 The next Brut Vintage release will be the great 2012…. Quite tight on the nose, but this really opens up on the palate. A hint of smoky spice and red fruits like plum and raspberry, wasn’t expecting that. Has a great full mouth-feel, with ripe red apples and lemons and hints of dried raspberry and redcurrants. Some of the creaminess bringing slight custard character just starting to come through. The intensity of the fruit and bright acidity makes it feel like the dosage is lower! Jumps right out on the nose, immediate richness of fruits and wow what creaminess. The palate is still very youthful and bright acidity and ripe fruits have so much going on, apples, vanilla, pastry and tension with a lovely length that has a slight salty almond finish. This is rather nice, no spitting rule based on its potential score! Quite soft on the nose and palate, acidity is quite racy and forward but makes a lovely drink. Not that complex, but there is something quite engaging about this. Hint of the ripe red raspberry with slight spice character to the apple. Lovely mouth-feel. Right there on the nose, with creaminess and bundles of fruit. Really forward, which is balanced on the palate, acidity seems bright and still seems very young, certainly more so than the vintage. Seems to finish a bit dry, perhaps one to drink in the next few years. Has some oxidative character and brown apple character starting to dominate. Acidity starting to dominate and fruit seeming to not be holding up, hint dry edge on the finish. Poor bottle? Or needs drinking? Has this more creamy character that is foreword but almost has a white burgundy character and bright acidty and all that lovely mushroom richness and nutty character. Seems much younger than the ones I have previously tried. Has lovely length rich and full and quite vinous. This has the potential to show off for a few years yet. 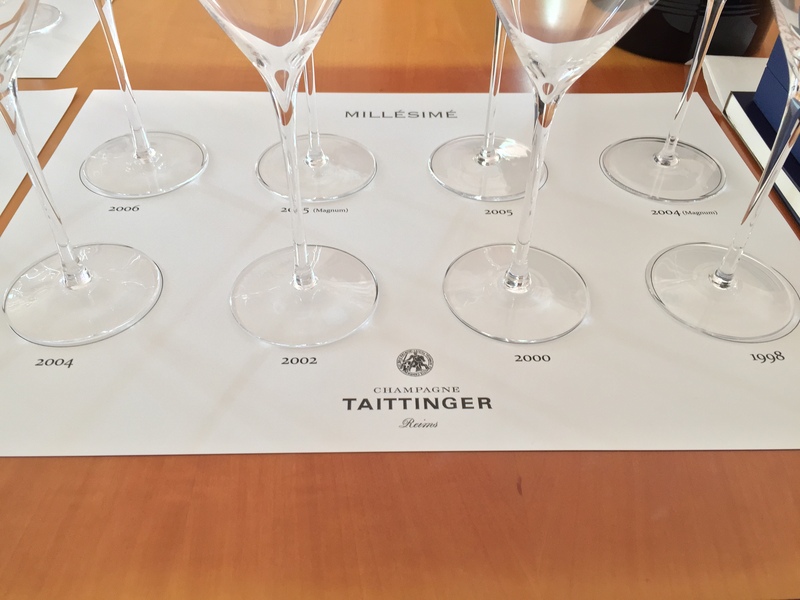 Next up, Dupont kindly shared with us an insight into the future for Taittinger. 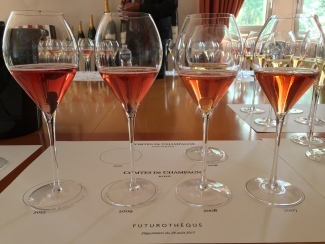 As part of their Futurothèque project, the House disgorged a select few bottles of future vintages of Comtes and Comtes Rosé to assess their development. Whilst they are all still ageing on their lees and will benefit greatly from a few extra years development, it is always an interesting experiment to track their growth. 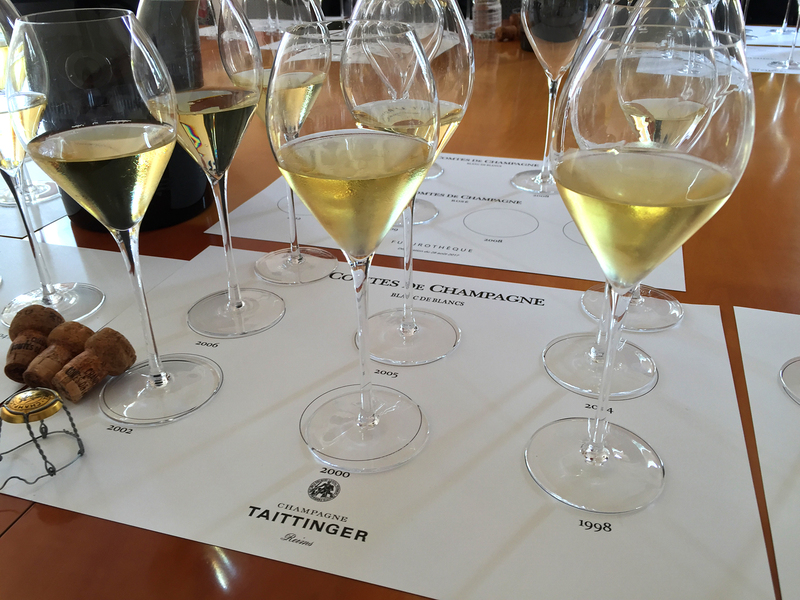 Dupont told us that Taittinger will release a Comtes 2007, but due to the heat of the year they picked early and only made a tiny amount. 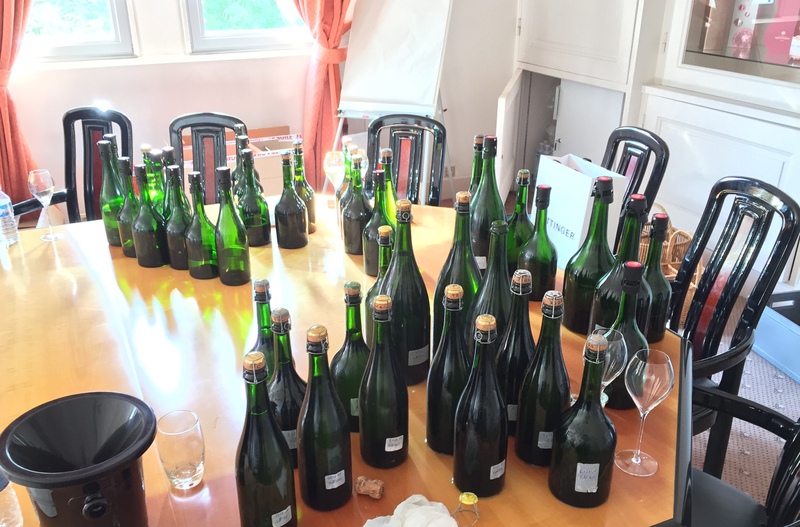 Following that will come Comtes 2008, likely released in 2019. As 2009 was a weak Chardonnay year, Dupont just produced a Brut Vintage. The reverse was true for 2011; a small amount of Comtes was produced due to the strength of the Chardonnay but the Pinot Noir was “very weak”, meaning no Brut Vintage. 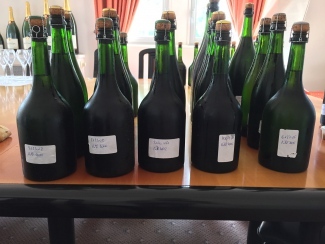 The next Comtes release will then be the hotly anticipated 2012, which will see the first ever Comtes jeroboams released, in response to the growing market demand for bigger sizes. Has some purity and spiciness. Good acidity and great mouth-feel, some lovely smokiness and wow how balanced is this. Dosage is a little prominent right now, but this has such energy, orange zest and power. Rich in citrus right now, lots of lees character and wow what great texture and acidity. Has a lovely linear pure character and a hint of spiciness – 2002/2008 and 2012 all looking great. A light floral nose and a hint of roses and raspberry. Quite delicate nose which broadens on the palate with spiciness and grapefruit; really delicate. Love the spicy character, great length and refreshing acidity. An afternoon’s work of scientific research…. Lovely nose, though very tight. Palate seems very bright acidity and good power of red fruit. This seems to be one to have in your cellar; lush and rich and seems really rather brilliant. Has energy and tension you don’t often see. Lovely fruity strawberry, this is just starting to develop on the palate. Seems quite soft and gentle right now. Very bright colour and still youthful. Loads of bright raspberry fruit and blackcurrant. Acidity seems dominant right now but has a freshness and juicy fruit character so no doubt one to watch. Everything seems just right. Amazing although so young.